You're very privileged to have one of my biggest dinner party secret recipes. 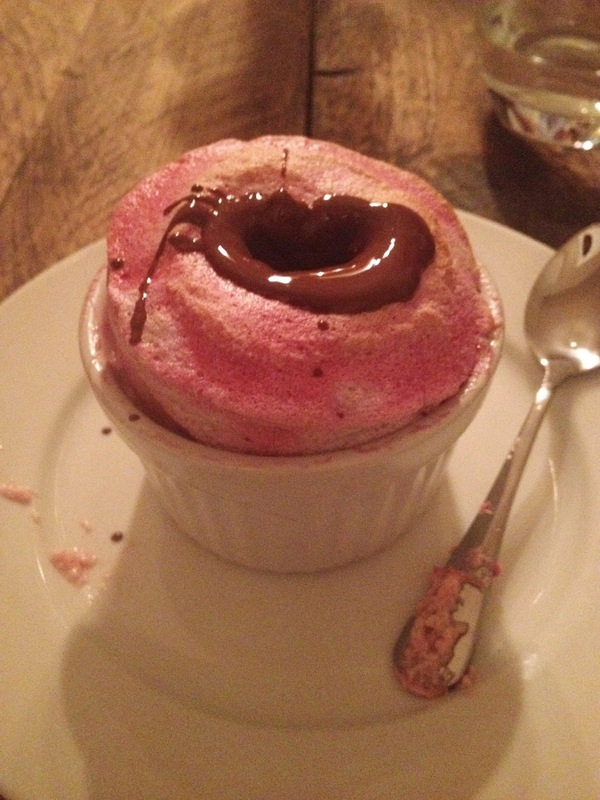 Souffle's are similar to a lightly baked fluffy cake that should puff up when cooked. It's a combination of a flavoured base combined with egg whites, the base provides the flavour and the egg whites give the lift. They are notoriously hard to make so you'll impress by serving this dessert. The big secret is that this recipe is fool-proof and if you follow the instructions, you'll have perfectly risen delicious souffles every time. I found this recipe on BBC good food a couple of years ago and it's been one of our favourites ever since. It's particularly good at the moment as we have an abundance of raspberries from our allotment. We get a punnet like the above photo every other day from just a few canes, such an amazing crop we've been enjoying them for weeks now. But if I'm making this in the winter I use frozen raspberries from the supermarket which are just as good. The souffles themselves are fairly light so I like to pour chocolate sauce in the middle of them. Chocolate with raspberries go together so well, one of my favourite ever combinations I think. You'll need a ramekin dish per person. The ingredients listed serve two so scale up accordingly. If you have any extra mixture left they keep well in the fridge and can be cooked the next day or cook on the same night and then microwave for 30 seconds the next day and they will rise again. 1. Evenly butter and sugar ramekin moulds and put them in the freezer. - Make sure you get the butter and sugar right around the edges and rim to give the mix something to grip on to as it climbs, this step is really important. 2. For the coulis - add half of the sugar to the raspberries, place in a hot pan and cook quickly for 2-3mins with some of the lemon juice. 3. Push the coulis through a sieve to remove the crunchy seeds. 4. When ready to cook. Place 2tsp of coulis in the bottom of the frozen soufflé dishes and thicken the remaining coulis with the cornflour in water. 5. For the souffle mix, scald a bowl and whisk in boiling water to get rid of any grease. Then place the egg whites in a bowl and whisk. 6. Gradually add sugar until a smooth, soft peak comes. Add some more lemon juice. 7. Take a third of the mix and whisk into the thickened coulis, before gradually folding remaing two thirds. Try not to knock too much air out of the mix by overmixing. 8. Divide between the ramekin moulds and smooth the surface with a palette knife. 9. A secret tip to get them to rise straight up is to indent round the edges with your thumb. 10. When ready to cook, space in a tray and bake in 180c oven for about 13 minutes. Try and resist opening the oven door while cooking, just check after 11 minutes. 11. While it's cooking, melt your favourite cooking chocolate in the microwave and mix with some cream to make a thick sauce. - My oven doesn't have a window in it so it's really hard to know when to open! But I'd say go over than under and about 12-13 minutes is perfect. Then serve straight away (while trying to take a photo before they sink) with a dusting of icing sugar, make a hole and pour the hot chocolate sauce into them. 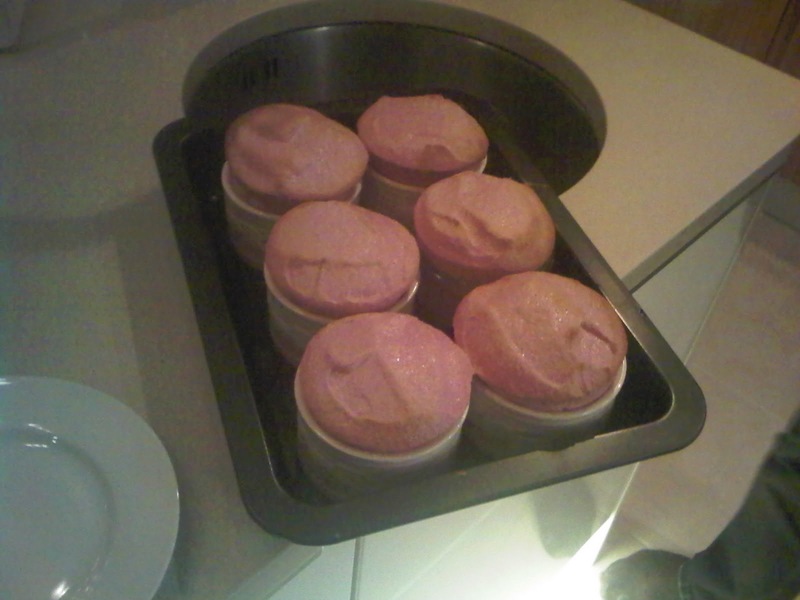 Souffle's will wait for nobody! Make sure everyone is ready to get them at their full effect. Let me know how you get on if you make them.